DEVELOPMENT DIRECTOR SADDLES UP FOR CROSS COUNTRY CHALLENGE – Our Space, Your Place. 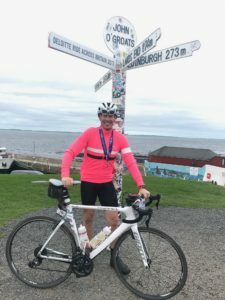 Jason Corner, Development Director at David Wilson Homes North West has completed the impressive task of cycling from Land’s End to John O’Groats in just nine days. The national Deloitte Ride Across Britain event saw hundreds of participant’s cycle 969 miles across the length of the country, averaging 107 miles per day. The gruelling challenge was completed in order to raise money for the leading homebuilders’ Charity of the Year – Alder Hey Children’s Hospital. Jason raised an impressive £2,000 through Just Giving pages which will later be match-funded by David Wilson Homes which will bring the total to £4,000. Alder Hey Children’s Hospital is a world-class, patient-friendly hospital which provides care for over 275,000 patients and families every year. Jason said, “The whole challenge was brilliant, I trained a lot for the ride and that paid dividends. It was fantastic to be able to do something I’ve always wanted to do and raise money for Alder Hey Children’s Hospital at the same time. The nine day challenge is just one of the tasks being undertaken by staff at David Wilson Homes North West as they battle to raise money again following last year’s impressive sponsorship total of £34,000. Staff members at the Warrington based homebuilder are running, cycling, swimming and even wing-walking to raise money this year.